Pastor Neil Carrick has long been an advocate of people’s right to structure their families according to their spiritual and personal beliefs instead of government mandated templates. He is most known for his efforts to actualize the separation of marriage and state by suing to decriminalize private religious marriage ceremonies that do not meet the license standards for Michigan. These links give some background that help put this latest effort in context. Libertarians Issue Statement In Support Of Reverend Neil Carrick On Religious Freedom. Rev. Neil Carrick To Speak to Wayne County Libertarians on Marriage and Religious Freedom. News Release from Neil Carrick. 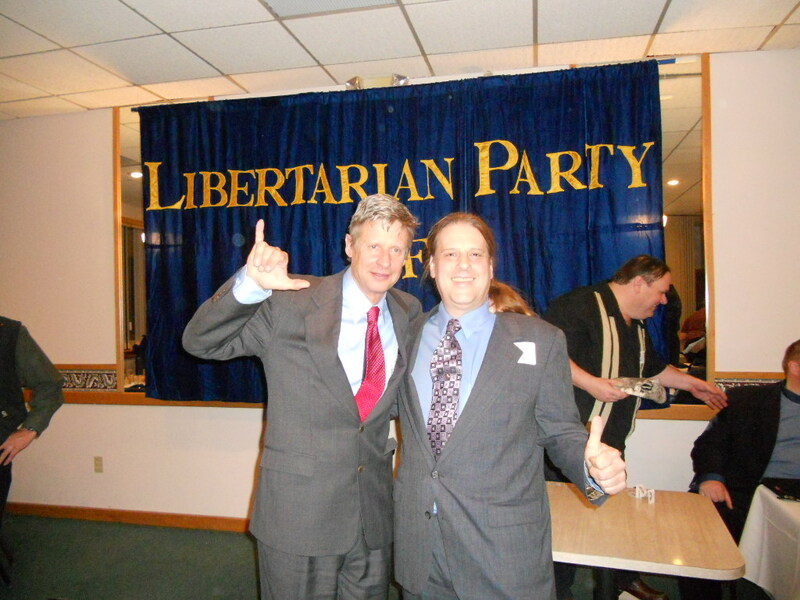 He was luncheon speaker at the 2015 Libertarian Party of Michigan convention. Neil Carrick Speaks on Religious Freedom at Wayne Co. LP Meeting. Pastor Neil Carrick and related parties including his daughter, couples and church will file Civil Rights Lawsuits in Federal Court. Pastor Carrick was the Pastor who brought a lawsuit against the state of Michigan will be bringing two lawsuits with other parties. The first one is against the Wayne Country Count regarding adult adoptions. in 2007 Neil tried to adopt an adult who he has known as his child since 2001 when he began care of her when she was 16 and her 1 year old daughter. The Wayne County Courts process creates a higher bar and special rules beyond that the code of Michigan provides. He was told by Wayne County Court employees he would not be able to meet the requirements because of these special rules. The state law or codes for Adult Adoption has minimum rules. The adoptee gives his or her consent to the adoption. If a legal parent of the prospective adoptee is alive, he or she is given notice of the proceedings, but consent is not required. The only one who needs to consent to an adult adoption is the adoptee. Pastor Carrick and his daughter will be filing the lawsuit in the coming weeks. Pastor Carrick along with other parties will be filing a lawsuit regarding the marriage laws of Michigan. The suit will seek to decriminalize private religious marriage ceremonies that do not meet the license standards for Michigan.Pastor Carrick will be joined by a congregation and potentially religious organizations and couples. You can find out more at carrickfamily.com in the coming days. Forgive me for the complexity and length of this email. This is regarding to potential upcoming lawsuits. I will try my best to explain this. But if you do not have a good understanding of the difference between de-factor and de-jure I would highly suggest that you spend a few minutes understanding the differences between the two. As many of you know I filed a lawsuit against the state of Michigan some time back regarding Marriage. In particular Religious Marriage vs State Marriage. In the end the typical issue of standing become problematic. The state arguing I did not have standing over the lack of harm basically. I have advocated for some time that Family life should have limited governance involvement. I have a daughter that is not my biological or adopted daughter. But I established as being my de-factor daughter in minor but significant ways in the Michigan Court as part of other cases. Michigan has code regarding “Adult Adoption”. In most counties I would most likely be able to file for adult adoption and successfully be granted it. But because of issues not related to this adult child it will most likely be thrown out and I be denied. I have an arrearage from another family court case that I have made arrangements on that happened during a period when I was disabled after a series of strokes. And another that is actually a result of the local administrative Friend of the Court system making continual mistakes because of a flawed IT system. I have already contacted the Court Administrator for the Wayne County Court who is asking their General Counsel to respond to me. My thoughts are they are going to in typical (court) fashion not find a solution that is reasonable but will kick to the Judge who would have to make a decision and deny my motion/petition regarding adoption. If they do it will create a “standing” for a lawsuit. If the Judge does so based on a reading of the local court rules I will be left with having to file for an appeal within the state court. If the Judge denies it based on a reading pf the state law than I will walk a civil lawsuit into the Federal Courthouse in Detroit. Having said that I have performed weddings involving situations that I believe could end in me having standing. Last Tuesday was the greatest election in my lifetime. Finally we libertarians have statist politicians right where we want them. If we play our cards right politicians will be supporting more policies that respect individual liberty, while distancing themselves from those that don’t. At first glance this may appear to be a celebration of Donald Trump’s victory. It isn’t. Rather, it is a celebration of libertarians attaining the balance of power at the Federal and state level. Here the phrase “balance of power” refers to the attainment of a greater number of votes by an alternative party candidate, then the margin of victory between the two establishment party candidates. For people trapped in the bipartisan paradigm, this is a situation to be avoided. For those who have broken free, it is cause for celebration. Well now the selection of the electors is over and Clinton supporters are blaming those who voted for Libertarian Gary Johnson or Green Party Candidate Jill Stein for Trump’s victory. If the results had been reversed, Trump supporters would be placing the blame on us instead. Unfortunately, many Johnson voters are feeling guilty, or dodging culpability by arguing that Libertarian votes affected both establishment parties equally. Whether or not the numbers support this last claim, the mindset that views citing such numbers as necessary is ultimately defeatist and condemns alternative parties to indefinite irrelevancy. If all libertarian leaning voters held their ground and voted for the Libertarian nominee, I have no idea who the current President elect would be, but I do know that we would be a much greater force to be reckoned with. I do know that Libertarians would have earned Federal recognition as a minor party, and more states would recognize us a major party. Most importantly, for the point I’m making here, supporters of the losing establishment party would still blame us. In 2000 Ralph Nader and the Green Party finished with only 2.75% of the vote, but were blamed for the defeat of Al Gore by George W. Bush because of the narrow margin of victory in some states, especially Florida. Neither Ralph Nader nor the other Green Party Presidential candidates have done nearly so well since. Though the claim that their participation in the election tipped the outcome in Bushes favor has been largely disputed, I think it is a good bet that many left-leaning voters have coward away from alternatives to the Democrat because they fear the so-called Nader effect. By contrast, Johnson won 3.28% of the national popular vote while Trump and Clinton’s votes differed by less than a percent. In Michigan Gary Johnson’s vote total was thirteen times as great as the difference between Trump and Clinton! So if attempting to deflect blame didn’t work for Nader, how can it possibly work for us? In my humble opinion it won’t and it shouldn’t. We are at a crossroads. We can either move full speed ahead and become players on the national stage, or retreat back to obscurity, cautiously avoiding the risk of tipping the scales in favor of the worst candidate. If we are to move forward, we must be willing to be blamed for every electoral outcome until we finally win. We must convince others that this course is a righteous one, and that our mission is more important than which of the establishment party candidates, wins a particular election. No matter how bad the winner is, that winner will need to draw from the libertarian voting block to win. This time that appears to be Donald Trump. As long as the Libertarian Party sticks to principal and doesn’t coddle the “lesser-of-two-evils” game he will need to go out of his way to win over libertarians if he doesn’t want the Libertarian Party to receive their votes in 2020. The Democrats will be doing the same if they expect to defeat Trump. It remains to be seen if they will be courting Green voters or Libertarians, or both on certain issues where Greens and Libertarians agree like marijuana, privacy, militarism and civil liberties … The more we refuse to chicken out, the harder they will try. Down-ticket, a strong libertarian party can have leverage even in races it is unlikely to win. If there is a critical piece of legislation we need passed, or rejected, we can make a deal. We can strategically chose to run or not run a candidate in a given contest. What about libertarian-Republicans or libertarian-Democrats? If they are really all that libertarian (and some are) they will have no problem attracting libertarian votes and will have no reason to fear the participation of a Libertarian Party opponent. Libertarian participation might even help them stick to principle; when establishment insiders try to lead them astray, libertarian-Republicans and libertarian-Democrats can pragmatically point to the participation of the Libertarian Party “spoiler” as a reason they can’t make an exception and vote for the tax increase or regulation that the establishment insider is trying to push. So we win even if we lose, the establishment parties can decimate the Libertarian Party by championing a libertarian agenda, or they can ignore us at their peril and watch us grow until we become a major party nationally, but either way libertarians win. Because we will have more liberty. More importantly, America wins, because everyone will either have more freedom in a two party system that bent to the wishes of libertarians, the way they once did to the socialists, or Americans will have a three party system where candidates will no longer be able to win elections by simply making us fear the other candidate. Instead they will need to give people a reason to vote for them, not against an opponent. So take pride in your Libertarian vote. Take the blame! Embrace it! Own it! You have the power to demand more liberty, and don’t be shamed into doing otherwise! I am a very active Libertarian. So when the general elections comes along, I will be voting for Libertarians. However, we are in primary season until August 2nd. So I am taking a break from my endless push for Libertarian Party candidates to chime in on Tuesday’s primary. First of all, I will address why there are no Libertarians in the primary. By state law only parties who reach a specific threshold for their top-of-ticket candidate are included in the primary system. We have not yet reached that threshold. So all of our candidates are nominated, at no cost to taxpayers, in Conventions and primaries. I live in Detroit’s Second State Representative District. In this solidly Democratic district Bettie Cook-Scott stands out as best qualified. She has served in the state house before and has a demonstrable record of being an advocate for the residents of her district. One distinction is that she is a retired police Sergeant, who was supportive of the late Ron Scott and his efforts in the Detroit Coalition Against Police Brutality. She correctly articulated the fact that all police should oppose police brutality, because it is their job to serve the public and prevent violence, not excuse it. She was a law-enforcement officer who chose her job because she cared about people, and that is also why she wishes to return to the Michigan House. On the topic of police, there are good cops and bad cops. I just endorsed one of the good ones. When I was awaiting trial, as a result of the conduct of a bad cop, only a couple friends showed up in support. One of those was Republican State Representative candidate Matt Schonert. I have known Matthew over the years as principled advocate for individual liberty. We first met through the 2008 Ron Paul campaign, and he has continued doing Paul’s work of trying to steer the Republican Party in a libertarian direction, as a Campaign for Liberty delegate, and now as a candidate for the fourth State Representative District. Also, through Campaign for Liberty I have come to know an incumbent State Representative from the Forty Fourth District. He is Jim Runestad. Representative Runestad has consistently supported legislation that is designed to make Michigan’s government more transparent, and more respectful of individual rights, and more respectful of individual privacy. Before being elected to the Michigan House, Jim Runestad was on the Oakland County Commission. While there, he introduced the “Liberty Preservation Resolution,” which stated that Oakland County would not be complicit in indefinite detentions as defined in the 2012 NDAA. Another incumbent State Representative from Oakland County is Martin Howrylak. Representative Howrylak is the type of conservative who truly believes in smaller, less invasive government. He has frequently introduced and supported legislation that shows he is willing to walk the walk. His principled support for liberty earned him the support of Oakland County Libertarians when he successfully ran for the Troy City Council in a non-partisan election. Opponents attempted to use this against him by claiming that Libertarians supported him because he was into drugs (A serious distortion of the Libertarian Platform). The attacks backfired since Howrylak’s personal commitment to conservative family values was beyond reproach; he is as clean as they come. Over the years I have found Howrylak to be a person who never compromises on matters of ethics decency, and honesty. If re-elected he will serve his constituents in the Forty First District with integrity. During my visits to Lansing on behalf of Brass Roots and Our America Initiative, I have become acquainted with another outstanding State Representative, Triston Cole of Michigan’s One Hundred Fifth District. Cole is a principled supporter of the right of citizens to own and carry firearms. He is a sportsman who believes in protecting the environment with out infringing on private property rights. He believes in fixing roads without raising taxes, and he knows that entrepreneurs, not government, creates jobs. If re-elected I am sure he will be an asset to his district. The Fifth State House District is a Democratic stronghold. One of the candidates in the Democratic Primary is the host of the talk show, Stand Up Now. She is Cynthia Johnson. Through her show, she has raised public awareness of the need for electoral reform in Detroit, a cause that I made the centerpiece of my City Clerk run in 2013. She has also brought attention to police brutality problems in Detroit and has organized walks to draw attention to the lack of adequate public lighting in Detroit neighborhoods. I am sure she could shine some light on Lansing politics as well. … their are none. There will be 69 Libertarians on the ballot in Michigan’s general election. None of them will be running against the above candidates. I’ve been a Libertarian since the eighties. I am of the variety who believes ALL human interaction should be voluntary. Each election season, I have yelled at the TV while crumbling up proverbial newspapers and pelting the pundits who followed every move of “BOTH” candidates. The World-wide web gave us a bit of a voice, but (in the average voters mind), the so-called MSM (ABC, CBS, NBC, CNN, Fox, AP and UPI) remained the final word on which candidates were credible. Anyone could post stuff online, and everyone does. This paradigm of the establishment media as curators of truth is dissolving, but not gone. Have I been alone in this frustration? Hardly. Until recently, this ideological shunning has been obvious to libertarians, and of no interest to people who were not minor party activists. For years the official political discourse had been about liberals, moderates, and extremists (meant in a scary-bad way). Enter Ron Paul’s second Presidential run. Twenty years after being the Libertarian Parties nominee, he returned to Presidential Politics as a libertarian-Republican. While the establishment did their best to marginalize him, they could no longer do so without being called out. Libertarians of all backgrounds were finding each other, and the Ron Paul campaign was the catalyst. Finally we were hearing the word “libertarian,” and people were using it correctly; but they were referring to the philosophy, not the party. Ron Paul supporters became the Campaign for Liberty, which has attempted to make the GOP more libertarian. I’ve been there, and can’t blame them for trying… but how’s that working out in this Presidential election cycle? Privately many C4L-Republicans have told me that in general elections, they vote Libertarian if no liberty-Republican made it through the primary. …but sometime between 2012 and 2016 change was underway. Those moments of hopelessness and frustration were punctuated by respectable recognition of the Libertarian Party by many of the mainstream broadcasters and publishers who had once shunned them. The major parties continue to nominate hard-core statist candidates, but this time the idea of picking the lesser of two evils is no longer taken for granted. Mixed in with the idea that Americans need a third choice, there is an acknowledgement that the choice exists, and that choice is the Libertarian Party’s candidate. Most of the time they name that candidate, and when they do, it’s Governor Gary Johnson. Something I have been working toward for about 30 years is finally happening. Conversations outside the echo chamber have included respect for the Libertarian alternative. This is beyond a token mention. There are interviews and analysis… even polling results indicate 10% of the voters being willing to support a Libertarian candidate. Most interviews with a Libertarian Presidential candidate are with Gary Johnson. He is also the candidate polling 10%. Of course there is one glaring omission to most of the hype, that Governor Johnson, himself, has to keep alerting people too: He has not been nominated. After years of stagnation and shrinking membership, the Libertarian Party is respected by regular people outside the movement. When Johnson was nominated in 2012, many Libertarians were overly optimistic about the effect of nominating a two-term governor. The fact was that the Libertarian brand was no longer taken seriously; most people found us to be irrelevant. In spite of that Johnson earned us a record number of votes, and in my home state of Michigan he earned the highest number of statewide write-in votes in the states entire history. The Johnson-Gray team never went away. Through the non-partisan issues oriented organization, “Our America Initiative” they had been providing a libertarian network whereby activists, working on libertarian legislation, could unite and lobby for it on an issue-by-issue basis. This way we were gradually showing relevance. Also, through Our America Initiative, Gary Johnson, Judge James P. Gray and others have taken the Commission on Presidential Debates to court. Even if the lawsuit fails, Libertarians are winning; we are on track to regaining our long-lost 50-state ballot access. I can hardly keep up with all the news reports and interviews that have focused on the Libertarian Party and the Johnson candidacy. I can hardly contain my excitement either (so I blog about it). Recent polls have Johnson at 10%, but if the libertarian nominee reached that 15% threshold, the commission could just close shop, thereby exposing themselves as a fraud to the general public. At this point we would be the proverbial naked man running down the street. Ignoring us would be like ignoring the 800 Lb gorilla in the room. We would have to be recognized by the people covering the election, and voters could begin to think of us as a viable choice; the death of the “wasted vote” argument is upon us. For years we have looked for the magic bullet. Little did we know that round was already primed in 2012, and if the Libertarian delegates are willing, it will exit the muzzle this weekend. This is our moment, but only if we seize it! But what about the message? Has it been watered down? In a way, but it’s a good thing. Here’s the Real Politik. A while back my late friend, Pat Clawson found that more people would support him petitioning to run as an independent rather than the much less costly option of being nominated at a Libertarian convention; they just didn’t feel right about the about the Libertarian Party. He said we needed to do some market research. Well, it’s been done for us. The sucess Gary Johnson has had reaching people outside the movement shows that he is doing something right. Perhaps those of us who thought the logical elegance of libertarianism would be universally recognized for its crystalline beauty were distracted from a blind-spot. People have different learning styles. The fact that they don’t readily agree with what ever we say, doesn’t make them sheeple. They think differently, and need to be spoken to in a way that makes sense to them if we are to persuade them to agree with us. To people who love to debate (as I do), he comes across as indirect. His policy positions often don’t go far enough to satisfy libertarian activists. This does not make him the perfect candidate at a Libertarian Convention. In 2012 Johnson was quick to credit R. Lee Wrights with out-debating him. However, Gary Johnson is the perfect candidate, and an excellent spokesperson, on the national stage. People connect with him emotionally. He doesn’t scare people, and his policy positions take us in the Libertarian direction. At an event in 2013 I asked why he supported a “harm reduction” approach to hard drugs, like heroin, rather than just legalizing them outright. His response was that everything he does must be “reality based.” I didn’t get this right away because I thought in terms of physical reality, but there is also the world of political reality. If one wants to affect change, one needs to get people on one’s side. Governor Johnson knows how to reach people where they are. In the current political context. The reality is that we live in a popular soft tyranny, not a state of nature. The reality is that we are not ruled over by a few statists with fancy hats. Millions of people put leaders in office, and most people are comfortable with what they do. The way to move from a soft tyranny to a relatively free society, is to appeal to that libertarian part of them that would like to remove government aggression from some part of their lives. Let’s give people a taste of liberty and hopefully they will want more. Respect the moderate Libertarians because we need them to move forward. They are reasonable, but cautious, people. They will vote for us, and we can expand liberty by getting government out of the way, one reform at a time. I have renewed optimism that we may finally reach critical mass, and we might even win the oval. I hope my optimism survives past this weekend. Obama’s so-called “Affordable Care Act” (BKA Obamacare) is devastating to many working class Americans. Unfortunately, the unions we pay to represent us, are not speaking up about this since they have become tools of the Democratic Party. The Democratic Party along with some Republican accomplices have betrayed labor, but labor would rather betray the rank and file then break the chains that keep them beholden to their political masters. 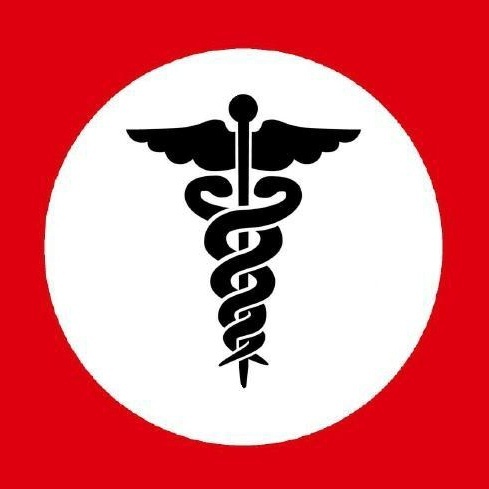 I am one of Obamacare’s victims. This is my story. If I am the only victim, then it’s no big deal…. but I have a feeling I have lots of company. I have never read about this in the mainstream media, but this is the truth. As a part-time college professor, I have been teaching at two institutions to earn a decent income. I have been able to use that money to buy my own insurance. Since the law passed my premiums have increased significantly with no significant new benefits. But that is the least of my problems. The ACA requires employers to buy health insurance for any employees who work three-fourths of full time or more. So many employees are having their hours slashed by employers who don’t wish to face penalties for giving their employees too many (sic) hours. Most people would expect this to force employers to restrict their part-time employees to 29 hours per week, since most people think of 40 hours as full-time. Such an intervention is bad enough, in principle, and a person struggling to make ends meet in the current depression may not be able to afford any loss in income. Nonetheless, the reality is even more outrageous. According to the ACA college faculty who teach over 11.5 hours per week are categorized as three-fourths full time. No, that’s not a typo. According to bureaucrats, the law says eleven and one half hours are three-fourths full time! Since my regular course load involved two six hour classes (12 hours total) per week, my hours have been nearly cut in half at one of the places where I teach. Fortunately, the union local at the other college refused to cave in and I still have all of my hours there. If I can’t find additional work in the next couple weeks, I may be faced with bankruptcy. Meanwhile I have had to forgo Christmas shopping in preparation for this impending financial crisis. The rank and file need to stand up and tell their unions to withhold endorsements from any candidates who supported the ACA or any part of it’s implementation. Workers of the USA unite! We have plenty to loose. Tea Party Welcomes Boman. Hoekstra Snubs Tea Party. 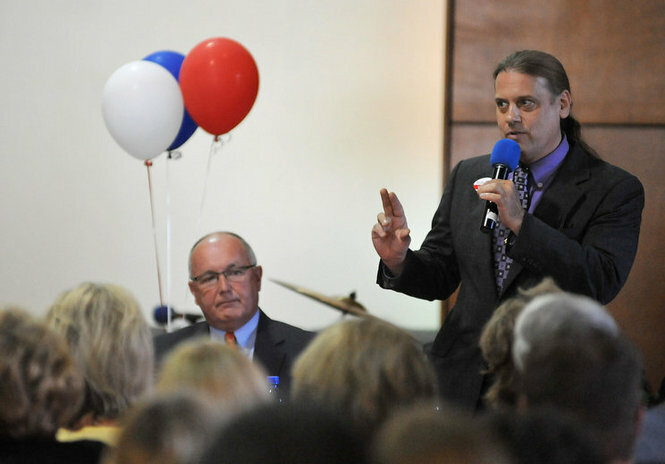 Boman Speaks as Hoekstra looks on in Grandville on May 14th, at the Eternal Word Church. learning he would have to face Libertarian hopeful Scotty Boman. 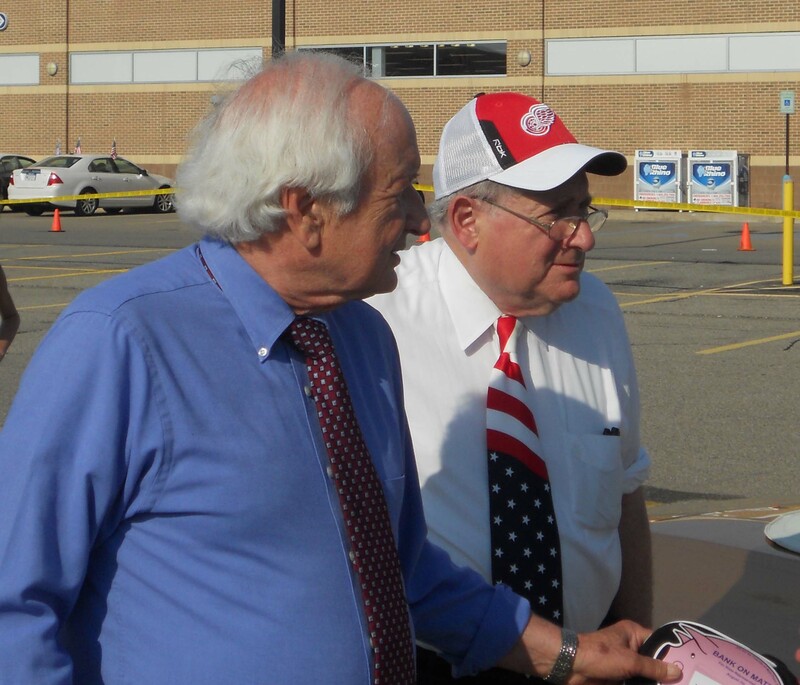 The forum was held by the Romeo Area Tea Party at the Palazzo Grande in Shelby Township and was moderated by WJR Radio Personality Frank Beckmann. During introductory statements, Beckmann explained the absence of former Congressman Pete Hoekstra by saying that Hoekstra was uncomfortable with the format, and objected to the inclusion of Scotty Boman in the forum. Boman commented that he expected Hoekstra to have a “…thicker skin than that.” The following morning (May 22nd) Beckmann addressed the snub again during the first segment of his 9:00 AM to Noon radio program on WJR AM. He specifically cited comments made by Boman at a forum held on May 14th as making Hoekstra uncomfortable. At the May 14th forum in Grandville, Boman speculated on who he would vote for in the Republican Primary if he didn’t qualify to be in it saying, “We’re still a little short and if these are the only candidates I have to choose from, I’m going with Clark Durant…He’s a person that really sticks to principle. He’s a man who has professional talent to get things done.” This forum, at Eternal Word Church, was only attended by Pete Hoekstra, Gary Glenn, Randy Hekman, Clark Durant, and Scotty Boman. Peter Konetchy (who qualified for the Republican primary) did not attend. On his May 22nd radio broadcast, Beckmann said Hoekstra viewed Boman and Durant as “a slate,” due to Boman’s favorable remarks about Durant. When asked, Boman has clarified this as a comment about his Republican Primary preference and that he would be voting Libertarian in November. In September of 2011 libertarian activist, Scotty Boman announced his effort to seek the Republican Party nomination for United States Senate, but fell short of the 15,000 signatures needed to file for the Republican Primary. As a result, Boman’s name cannot appear on the Republican Party’s Primary ballot. In 2008 Boman was on the general election ballot as a Libertarian. He placed third in the election. Libertarians nominate their State-wide candidates by a self-funded convention rather than a tax-payer funded primary. As a result, Libertarians can select their candidates at conventions, while also voting in major party primaries. Another candidate, Erwin Haas, is also seeking that nomination.